Tonight, Obama was the winner on the two points I used to judge the quality of the debate. Firstly, I looked for the connection with the audience using body language. Secondly, I looked for congruency between what was said and the corresponding body language. I saw a Robo-Romney who struggled to convey his convictions versus the sound-bites he had been programmed to give. 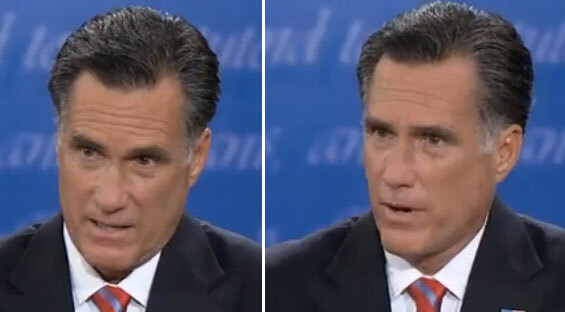 What Romney did with his chin and neck clearly let us see the sound-bite or the conviction. When it was a prepared message, he dropped his chin and pulled in his neck; swallowing hard several times throughout the sound bites. The tell-tale sign that confirmed sound-bite or conviction could be seen when Romney spoke about peace. He lifted his chin, his throat opened as his neck and shoulders relaxed — well, relaxed for Romney. Romney’s minimal hand gestures were out of the television frame, so their impact was negligible. Hand gestures for television are different than every day body language. One’s hand gestures need to be closer to the body and closer to the face to convey meaning on TV and his were not. He also needed to stop leaning on his left arm which prevented him from gesturing with both hands. Gestures are an important connection tool, as we will see in my discussion of Obama below. Romney needs to learn to pause and breathe deeply. This will make his movements more fluid and allow the listener to take in what he just said. Not pausing decreases the memory of the listener as they struggle to keep up. Speaking without pausing also raises the metabolism of both the speaker and listener at the subconscious level. Romney’s frenetic speech pattern activates the fight or flight part of our brain and this is interpreted as anxiety or anger. Several times, when both were arguing over points, Romney tended to look the bully. His skirmish with Schieffer over the time allotted looked petty. He could have gotten away with it if he had been breathing deeper and tipped his head to the side a bit. He didn’t. He concluded the skirmish with three “snorting-snickers”. A genuine laugh would have softened his display. Romney looked inauthentic because he listened without moving, breathed in a shallow manner and maintained a forced smile. Finally, Romney blew it at the end. He had the last word. He tilted his head to connect, he had his chin in play and his voice pattern was impassioned. We were all listening intently. Then he broke eye contact with you and me as he said “Thank you so much.” This loss of eye contact immediately broke the intimate connection he had finally gained with his audience. On the other side of the table, Obama built good rapport with his audience. Obama connected for two reasons, he is a great storyteller, full of personal, relatable moments and his tilted head gave him an intimacy compared to Romney’s rigidity. I don’t advocate the use of a tipped or tilted head, meaning the top of the head goes slightly left or right and the chin is off-center in the other direction. This is often seen as a submissive move. However tonight it worked. As my Grandma would’ve said, “You got some ‘plaining to do…” and that is just what Obama did. The slight tilt of the head showed contrition. Whether he did it on purpose or he did it unconsciously we may never know, but it worked. The tilt combined with the stories of local people, brought the foreign policy home to us. Stories show us why we should care. Obama still used his favorite verbal pause, the extended ‘Aannnddd’ to hold- the-mic which prevented Romney from intruding. This habit is most apparent when he has been surprised or unprepared for the question. When he is prepared, Obama is very good at the silent pause. As I mentioned before, the silent pause is where the impact of your words become clear. 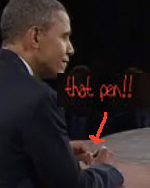 Obama was skillfully placing pauses throughout his stories tonight. 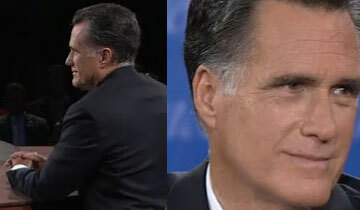 Obama baited Romney at every chance, and used two distinct movements to intimidate him. 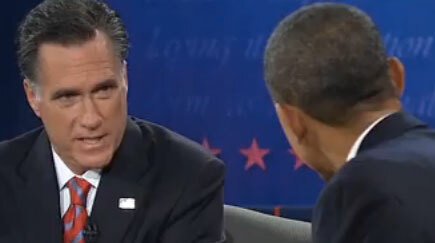 Obama would turn very quickly to make direct eye contact with Romney and then lean towards him with a verbal retort. The quickness of the movement adds to the perceived aggression without being verbally aggressive like last week. Obama was seen as verbally assertive. That is a fine distinction, but a necessary one to note. Assertive says “I’m in control,” aggressive does not. As a refinement, he would have appeared more comfortable being assertive if he had relaxed his jaw and kept his brows from going down. Obama needs better listening hygiene. He played with his pen, clicking it open and closed, twirling it and shaking his head which can be interpreted as obnoxious or disinterested. Obama needs to be aware of the number of times he does an unconscious side-to-side shake of his head as he talks. The side-to-side movement of the head says “No” while he is trying to convince us of his truth. The topics of Libya, Israel and Syria especially had the slight “No” movement accompanying his voice. Romney did this too, but not to the extent of Obama. To contrast, Romney’s preferred nonverbal “No” tonight was a wrinkled nose, leaving one to wonderabout what exactly was so distasteful. This was evident in his discussion of Pakistan. Obama placed his gestures well for the television viewing audience. He made good use of the downward open palm gesture. That gesture means this is serious and not open to negotiation. He used other gestures that were in line with his words. Throughout, and especially in his closing, he used gestures that swept back to him when he spoke of his success, his vision, goodness, truth and the American way. Gestures that end pointing at the speaker send the message that he is responsible for all the good. Obama did a solid, passionate closing and the quick head bob at the end added a period and exclamation point to his closing words. All in all, they both did well, and didn’t do any major faux pas’ that will need damage control. Where it really matters though, Obama was the winner in connecting with the audience. Obama’s skill as a storyteller and his comfortable deep breathing elicited confidence. His skillful use of the pause, made his message the one remembered. Romney, on the other hand, never consistently connected with the audience. His lack of pausing, his shallow breathing and small gestures undermined his message. Thanks for your very thoughtful and insightful analysis of each speaker’s strengths and mistakes. It certainly gives everyone some great tips for improving our own presentation skills, no matter what level we are presenting on. You are so right John, much of what I talk about I use with my group and private clients to UP-LEVEL their success, ACHIEVE greater influence and GET the end results they want quickly. As I sat and watched our third and final debate, I thought of you and “what would Sharon Sayler say” crossed my mind with a smile. With “all politics aside,” I don’t know who voters and our electoral college will choose, but based solely on body language and what you, Sharon so brilliantly and meticulously described, my guess is that Barack Obama has another four year term. Do you think? So as a person who notices winning communication and winning commentaries which you have generously shared with us, I highly recommend your book, “What Your Body Says” (And How To Master the Message. Relationships are lost, interviews cut short, potential job hopes dashed, and yes even Presidential candidates win and lose campaigns, all based on “What Your Body Says.” Your book truly is my reference on non-verbal communication and all the things you can say without saying a word. Sharon, thank you once again for more remarkable insights and tips that will enhance our communications and ultimately our world. Thank you for your kind words. It’s an honor to be of service and a blessing to be able to do what I love. I’m not going to second-guess on who the voters will make the next president. If we go back just a few posts, we find my critical review of President Obama in the first debate at http://sharonsayler.com/2012/10/what-romney-and-obama-is-saying/ I try hard to offer a balanced view, stay apolitical and just call the nonverbal communication like I see it. The first debate, Romney clearly had the advantage, during the town hall event they both spent too much time sniping at each other and lost the perfect opportunity to really build rapport and connect with voters. 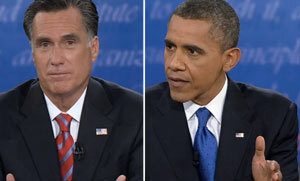 Obama used nonverbal communication in the the third debate to his advantage more than Romney. I just shine a light on what my years of training show me…. I’ll let the voters decide. Your observations are once again highly enlightening and on point! As a UK citizen I am able to view your presidential debates with no bias and since I read your book, often watch such things reading the body language ignoring the verbal messages entirely.Often watching it a second time without sound to judge my unconscious responses to the non verbal message. Everybody knows about the initial tug of war handshake that initiates contact between the candidates. Yet for me the most enlightening message came after the debate when the president directed with a subtle gesture where the final handshake would take place Romney dropped his head, obligingly, subconsciously reacted. Romney, let his guard down thinking the debate over when the speaking had stopped. I’m sure you spotted this gesture of dominance Sharon and would encourage anybody interested to review just that snapshot, it’s very interesting, clearly shows which candidate is demonstrating non verbal dominance! Thanks to you again for your observations based on concepts shared in your excellent book!